When I opened my first iPhone box, I was delighted. Here was a package that didn't require a knife or scissors to rip apart. Instead, it demonstrated deeper levels of thoughtful design by gently unfolding to a neatly designed interior. The shapes pleased my eyes. How does your organization "unbox"? Apple helped create a trend in unboxing experiences by extending optimized customer experience outward. They even have a "secret unboxing room." Extended experience applies to small businesses as well as design leader behemoths like Apple. I used to frequent a wine shop in downtown Charleston. Jack, the owner, seemed to greatly enjoy leading me along a continuum of wines to try. He was clearly interested in my having a great experience with the wines he sold. The unsolicited education about wines I received made me want to bring my business to him even though I could have purchased elsewhere for less. Effective marketing is no longer just about attaching good feelings to a product. Now the way to carve out a distinctive advantage is by creating great experiences for customers at every point of contact coupled with media systems to share them with the marketplace. Do you know what feelings you want people to associate with your company? How closely does the experience of the customer match that? What feedback loops do you have in place to reinforce and guide the creation of great experiences? What would be different with an optimized program to lead your customers to great experiences to the highest level? As a way of calibrating where your company is perceived and clearing a path to more great customer experiences, I offer this 5-step model of mission centeredness. Each higher level leads to a further expansion of consciousness and creates more differentiation. Advancing through the levels doesn't mean you lose the benefits of the previous levels. Rather, they amplify the power of the other levels. If a customer enjoys interacting with your company at every stage, they'll enjoy the product or service more by the association with an organization that connects with their values. Here the leadership of the organization is centered on the results for the company and its shareholders only. Decisions are made purely from the perspective of what will result in the highest profits. With a product/service focus, the intent is on creating a better mousetrap, relative to the other mousetraps on the marketplace. The ad copy speaks of and shines a light on how wonderful the product or service is. 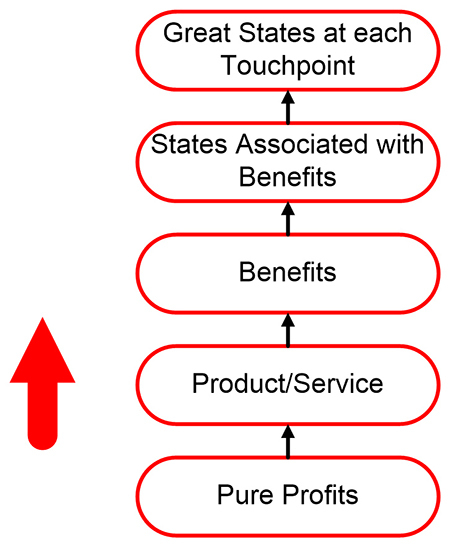 What does the product or service actually do for people? Are you selling the drill bit or the hole? The car takes somebody out of his immediate neighborhood so he can check out the surrounding countryside. It also frees up his family from having to live in the city. Ferrari speaks of the passion of its cars: the feeling of freedom of driving a convertible through the countryside on a beautiful spring day with the wind in your hair. The sense of the benefits provided shifts from the logical and rational to the emotional. The logical reasons are still there, but people make decisions based on emotion and just need the logical reasons to back them up. It's not only the use of the product or service you sell that offers an opportunity to create great feelings in your customers. Every interaction your customer or prospect has with your company offers the ability to create great feelings in them. So, having a map of customer contacts that extends all the way to the first interaction can illuminate creating the fuller experience. Sort the touchpoints by type: web, in-person, phone, media. Make a list of feelings you want your company associated with and link to the touchpoints. When it is a human interaction, note both the states you want the customer to experience and the states you want your team member to be in. How do you create the kind of culture that makes this happen? Learn more at 5thLevelWeb.com.